The Amazon Prime HTTP proxy error appears when you try to watch Amazon Prime Video while connected to a VPN. Fortunately, there are some VPN services that still work with Amazon Prime Video. 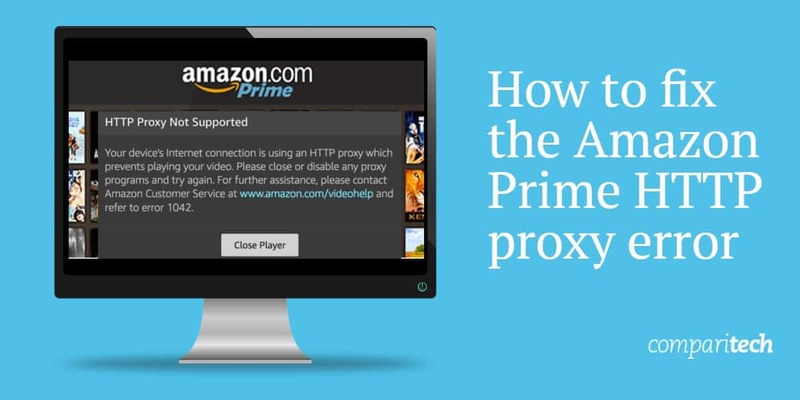 We’ll show you how to fix the Amazon Prime HTTP proxy error. The fact that you’re here reading this article suggests you too have come across the following HTTP proxy error on Amazon Video: “Your device’s Internet connection is using an HTTP proxy which prevents playing your video. Please close or disable any proxy programs and try again.” This means that your VPN or Smart DNS proxy has been detected. Also known as a “Virtual Private Network”, a VPN helps you unblock region-locked services like Amazon Prime Video abroad. It does this by encrypting your device’s traffic and routing it through a server in another country. For example, if you’re trying to watch the American version of Amazon Prime Video, you’ll want to connect to a server in the US. Unfortunately, Amazon blacklists the IP addresses of many VPN servers, which means only the best VPNs are able to bypass the restrictions. ExpressVPN: Fixes the Amazon Prime HTTP proxy error. Fast and reliable connections. 24/7 support, user-friendly apps and a high level of security with encryption. NordVPN: Works well with Amazon Prime Video. Over 5,000 servers in 60 countries. Use on up to 6 devices. Easy to use apps and excellent privacy protection with a no-logs policy. CyberGhost: Unblocks Amazon Prime and offers app for Amazon Fire TV and Fire Stick. Connect up to 7 devices simultaneously. Protects your privacy with a strict no-logs policy. PrivateVPN: High speed service for streaming Amazon Prime. Easy to use for beginners and allows up to 6 simultaneous connections. Secures your data with encryption. Surfshark: Unblock geo-restricted streaming services including Amazon Prime Video. User-friendly, 24/7 support and unlimited connections. Offers app for Amazon Fire TV. Choose one of the VPN services that still works with Amazon Prime Video – we recommend ExpressVPN. Download the appropriate software for your operating system. The best VPNs offer apps for desktop and mobile. Some even offer browser extensions. Open the VPN app or browser extension and connect to a server in the region you wish to access. This might be the USA, for example. Go to Amazon Prime Video and open the content you want to watch. This should now be unblocked, with no HTTP proxy error. If you are still coming up against the HTTP proxy error, try clearing your browser’s cookies. Alternatively, try another server or contact your VPN’s customer support. ExpressVPN is the most reliable VPN for fixing the Amazon Prime HTTP proxy error. This VPN has over 3,000 servers in 94 countries and has consistently worked with Amazon Prime Video. With unlimited bandwidth, very high speeds, and the ability to unblock platforms like Netflix, BBC iPlayer, and ESPN, ExpressVPN is perfect for streaming. One of the best features of ExpressVPN is its customer support. In all likelihood, you won’t need it that often, but if you do, you can reach is 24/7 over email or live chat. This is a very user-friendly VPN service with a great selection of apps and browser extensions. Setting up, connecting to a server, and watching Amazon Prime Video is quick and easy. Whether streaming Amazon Prime Video or simply browsing the web, your online security is paramount. ExpressVPN encrypts your traffic with 256-bit AES encryption and protects against DNS leaks. A kill switch and the split tunneling feature lets you choose which traffic you’d like to route through the VPN. ExpressVPN keeps no logs and is based in the British Virgin Islands, where there are no data retention laws. You can use ExpressVPN on Windows, Mac, Linux, Android, iOS, and routers. Chrome and Firefox browser extensions are also available. BEST VPN TO FIX PROXY ERROR: It’s fast, reliable and able to unblock platforms like Amazon Prime Video and Netflix. Features 24/7 support, user-friendly apps, and browser extensions. 30-day money-back guarantee means you can try it out risk-free. NordVPN has over 5,000 servers worldwide and works well with Amazon Prime Video. One of the advantages of so many servers and IP addresses is that you’re always likely to find one that works with geo-restricted content. In fact, NordVPN unblocks many popular streaming services including Netflix, Hulu and HBO Go. Whether you’re browsing, streaming or video calling, NordVPNs has fast servers with less load and unlimited bandwidth. We feel that NordVPN offers good value for money, particularly considering you can use it to secure up to six of your devices. Another advantage is that it offers very intuitive, easy-to-use apps as well as browser extensions. NordVPN is also extremely secure with 256-bit AES encryption, DNS leak protection and a kill switch feature. This VPN service is headquartered in Panama where there are no mandatory data retention laws. Regardless of this fact, NordVPN operates a no-logs policy. NordVPN apps are available to download for Windows, Mac, Linux, Android, iOS, and Android TV. Browser extensions are also available for Chrome and Firefox. Routers require manual setup. GREAT VALUE VPN: Able to fix the Amazon Prime HTTP proxy error, it also works with Netflix. Has over 5,000 servers and can be used on up to 6 devices. Secure with encryption and a no-logs policy. 30-day money-back guarantee. CyberGhost is a highly secure VPN service that lets you prevents the HTTP proxy error on Amazon Prime. What’s more, CyberGhost offers an app for Amazon Fire TV and Fire Stick, making it a particularly attractive option. It has a little over 3,800 servers in 60 countries, allowing you to access geo-restricted content from around the world. The high speed servers and unlimited bandwidth allow for streaming in 1080p HD without any noticeable lag or buffering. This VPN is a great option for families as it allows up to 7 simultaneous connections. It’s also ideal for beginners, with apps that are simple and easy to use. CyberGhost makes it easy to stay safe online, with 256-bit AES encryption to secure your data as well as protection from DNS and IP leaks. Also included in this Romania-based VPN service is an automatic kill switch and a strict no-logs policy. The following apps are offered by CyberGhost: Windows, Mac, Android, iOS, Amazon Fire Stick, and Android TV. Browser extensions are available for Chrome and Firefox. Manual setup is required for Linux and routers. SPEED AND SECURITY: offers excellent overall security, and easily unblocks Amazon Prime Video abroad. Provides an Amazon Fire TV and Fire Stick app. Use on up to 7 devices simultaneously. 45-day money-back guarantee. PrivateVPN is a high speed service that’s ideal for streaming Amazon Prime as well as Netflix. This is a smaller VPN with servers in 60 countries including the US and UK. In our testing, we found connections to be very stable, with no buffering while streaming in 1080p. It’s worth knowing that PrivateVPN lets you connect up to 6 devices simultaneously, all of which are assigned unique IP addresses. While not available 24/7, the PrivateVPN customer support is excellent as you’ll be speaking to the developers directly. Aside from live chat and email options, PrivateVPN also offers remote desktop help. However, the apps are extremely user-friendly and should pose no problems even for beginners. Headquartered in Sweden, PrivateVPN states that it keeps no traffic logs and doesn’t know what you’re doing online. It includes 256-bit AES encryption, DNS leak protection and a kill switch feature. You can use PrivateVPN via its apps for desktop (Windows and Mac) and mobile (Android and iOS). However, Linux and routers require manual setup. FAST SERVERS: for streaming Amazon Prime Video and Netflix. Allows you to secure up to 6 devices. User-friendly apps and includes all essential security features. 30-day money-back guarantee. Surfshark is a relatively new VPN service that launched in 2017. Aside from being able to fix the Amazon Prime HTTP proxy error, Surfshark also unblocks Netflix, BBC iPlayer, and Hulu. Although it has a relatively small network of servers, Surfshark has high-speed servers in 50 countries. As such, you should have little problem unblocking geo-restricted content wherever you are. A standout feature of Surfshark is that it allows an unlimited number of connections. This means you and your family can secure all of your devices simultaneously. It also offers excellent 24/7 customer support which we found to be helpful and quick to respond. We can recommend Surfshark to beginners as it’s extremely easy to use with well-designed apps. Surfshark protects your data with 256-bit AES encryption, DNS leak protection, and a kill switch. It’s based in the British Virgin Islands and has a strict no-logs policy, keeping no connection or activity logs. Surfshark offers apps for the following: Windows, Mac, Android, iOS, and Amazon Fire TV. Browser extensions are also available for Chrome and Firefox. Manual configuration is needed for Linux and routers. UNLIMITED CONNECTIONS: Amazon Prime Video abroad, without receiving the HTTP proxy error. It offers an app for Amazon Fire TV, allows unlimited connections, and provides 24/7 support. All plans include a 30-day money-back guarantee. Can I use a free VPN to fix the Amazon Prime HTTP proxy error? Amazon regularly blacklists IP addresses belonging to VPNs, meaning most free VPNs are unlikely to work. Free VPNs tend to have too many users on a limited number of servers and these IP addresses are quickly flagged as a result. In contrast, the best paid VPNs for Amazon Prime Video have hundreds or even thousands of servers and IP addresses. What’s more, some paid VPNs even offer apps for Amazon Fire TV and Amazon Fire Stick. If you’re fortunate enough to find a free VPN that does unblock Amazon Prime Video, chances are performance will be comparatively poor. Free VPNs tend to have slow servers and offer very limited bandwidth. You’ll therefore find it difficult to stream HD videos without being interrupted by frequent buffering and severe lag. Security is one of the main reasons to avoid using a free VPN. For starters, many free VPNs don’t secure your data with the highest level of encryption (and in some cases, they use no encryption at all). They may also lack important security features such as an automatic kill switch. Some free VPNs have even been known to sell logs of your online activity to third parties. What can I watch on Amazon Prime? 13 Can I use a free VPN to fix the Amazon Prime HTTP proxy error? 14 What can I watch on Amazon Prime? 8 Can I use a free VPN to fix the Amazon Prime HTTP proxy error? 9 What can I watch on Amazon Prime?